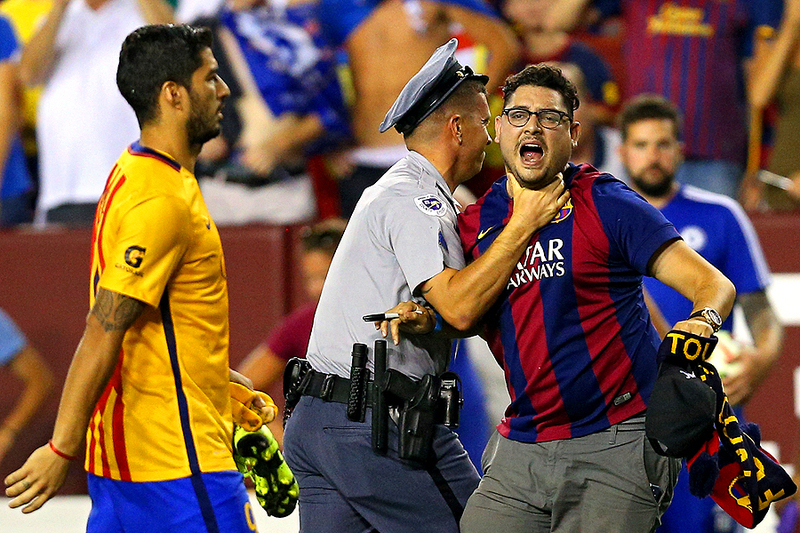 "A fan is restrained by a police officer after he ran onto the field and neared Luis Suarez #9 of Barcelona following their loss to Chelsea during the International Champions Cup North America at FedExField on July 28, 2015 in Landover, Maryland." In sports, anything can happen at anytime. When speaking to students, I stress from them to look for action away from the action. Turn around and look to the crowd. Keep their eyes combing the sidelines during play. And to shoot before and after the final whistle. Following a tight contest between FC Barcelona and Chelsea during the International Champions Cup North America everything seemed normal. Then a pair of fans sprinted onto the field as players made their way off. This is always terrifying because no one knows their intentions. Thankfully, their are police officers to restrain these fans from doing whatever they may be trying to do with mega superstars around. In this case, this fan simply appeared to want an autograph as he clutched a sharpie pen. But again, no one really knows. It's sad. It's comical. It's scary. Yet these type of fans make sports - well - sports.